What We Can Learn From Waldorf Hotel Affair? 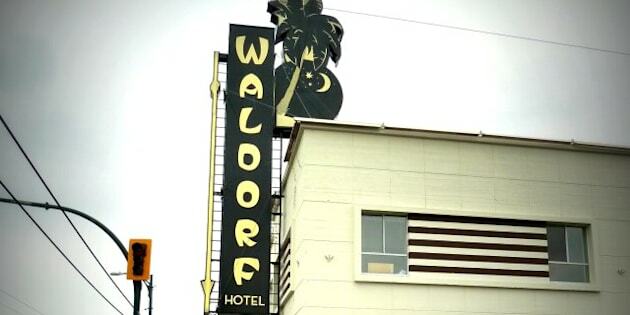 The news of the demise of the Waldorf Hotel was described by one Vancouver journalist as being like a "small neutron bomb" going off. At least with real neutron bombs the buildings will be left standing, which is probably not the fate of the storied Waldorf Hotel on East Hastings Street. Even if a wrecking ball does not take down this modernist-influenced remnant of Vancouver's past, its days as a cultural hotspot came crashing down this week. Judging by the howls of outrage over social media, it was though the Polynesian-themed Tiki bar was a second living room for a huge mass of people. Most likely a lot of the reaction came from folks with a sentimental attachment to the venue, if not a lot of recent experiences. Some lamented the loss of a decades-old watering hole for longshoremen. Hipsters of all ages shook their fists at the developers and city officials who would not save the building. When the mayor of the city issues a terse statement and takes no media questions about the matter, you know that there is more to the Waldorf affair than meets the eye. Make no mistake — this matter is rife with politics. For the uninitiated, here's what has transpired so far. On Wednesday the three proprietors of the hotel (aka Waldorf Productions), who revived the moribund venue after occupying it just over two years ago, issued a strongly-worded press release condemning the building owner for tearing up their long-term lease agreement, and selling the building to a housing developer. In protest, they were walking away from the venue, effectively shutting down the restored bar, restaurant, gallery and lounges, and putting many employees out of work. Breaking a lease is an unsavory move on the outgoing landlord's part, but not surprising given that millions of dollars were on the line. It is believed that Waldorf Productions struggled to keep the operation afloat, and relied on the landlord to relax their rent payments. In statements reported Thursday they denied this. Out of the eruption of emotion over the Waldorf's loss came threats from bloggers who, figuratively at least, planned to jump in front of the bulldozers. An online petition was begun to convince city council to block any rezoning of the Waldorf property to permit residential development. The new owner, Solterra Group, issued a statement on Thursday saying they wanted to "keep an open mind" about the future of the Waldorf, which could be interpreted as a wink to city hall for land use concessions. Coyly, they added, "we are studying all the options." For Mayor Gregor Robertson, the loss of the Waldorf left him stuck between a rock and a condo. In my view, it was a mistake for the mayor to issue a statement saying that he "hoped" that the hotel "will be able to re-launch and return in some form in the near future." As vague as these words are, it immediately gave the developer the upper hand. Thanks to Hizzoner and hundreds of ticked-off Twitterati, it was as if Solterra struck gold. The Waldorf story is interesting in part because Robertson and his Vision party have courted the East Van under-40 crowd who support venues like the Waldorf. While they may not vote as much as their elders, these folks give the political organization an Obama-esque lustre Vision craves. Notably, Vision Vancouver held a few gatherings for supporters at the Waldorf. Patronizing the lounge showed, symbolically at least, that Vision backed Vancouver's independent arts and culture scene. Deep down, however, Vision Vancouver is still a developer-supported party just like their counterparts in the NPA. Keeping developers on-side, and their millions in campaign contributions flowing in, will at times require the mayor to dance on the head of a pin. Such is the case with the Waldorf affair, where Robertson risks upsetting both the artsy types who admire him, and the developers who fund his political campaigns. If Vision seems a little touchy about the Waldorf issue it might be because it adds to a list of cherished cultural venues that have fallen on their watch. These include the Pantages Theatre, and the Ridge and Hollywood cinemas, which are all slated to be turned into condos. Vancouver has been in a vicious cycle for years when it comes to creating good venues for music and the arts to thrive. Old buildings that gain new life as a nightclub or a bar can become victims of their own success by making the property more desirable. That triggers higher rent, higher property assessments and higher taxes, which all get paid by the business owner. Over time the business can no longer make a profit, or the landlord decides to sell it because of its increased value. Even if you find an old building to retrofit as a cultural venue, Vancouver's onerous building code standards are too much of a barrier to make it happen. Nobody who aspires to create an accessible cultural venue can afford tens of thousands of upfront costs to bring buildings up to code. In cities like Portland and Olympia, Wash. where music and arts venues thrive, local governments have learned to relax these building regulations while working with business operators to make sure matters of life safety are addressed. In Vancouver, B.C., all you hear is that kind of helpful culture does not exist at the permits and licences branch of city hall. While many of us are sad to see the cocktail umbrellas at the Waldorf Hotel folded up for good, is there hope for something to replace it? Yes, but only if the political will is really there to cut red tape. New, equally exciting venues may still rise from the rubble of the Waldorf affair. The power for change is now in the hands of the mayor and city council.